Bird calls can enhance the bird-watching experience of both professional and amateur bird watchers. Observing the different species of birds (scientists estimate that there are seven hundred bird species just in North America), their behaviors, patterns and interactions is a hobby that many bird watching enthusiasts enjoy worldwide. 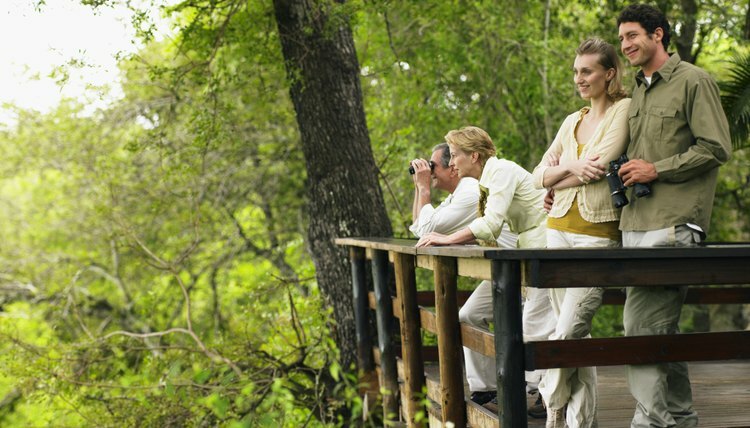 Many bird watchers use a bird call which can attract species of birds that otherwise might not appear. Making a bird call is not complicated, and with practice it is possible to produce a number of different call sounds with the bird call. Cut two rectangular blocks of wood. Any wood type will work fine. Each block should measure approximately four inches long by two inches wide. Gouge a small groove, about one eighth of an inch deep and one eighth of an inch wide, on one flat side of each piece of wood. This notch will run the length of the wood piece. Cut open a wide (approximately one eighth of an inch) rubber band. Lay it lengthwise along one block's notch and place the other block on top of it. The rubber band will lay in the middle of the two blocks. The rubber band must measure six inches in length so that at least one inch will stick out from each end of the wood for the bird call. Wind the duct tape around the blocks at each end, taping the two blocks together. Tuck the ends of the rubber bands securely under the tape while taping the blocks. The tape must hold the rubber band firmly in place between the two blocks of wood to complete the bird call construction. Blow into the hole where the rubber band is to make the bird call sounds with the bird call. Pull the rubber band tighter or looser to change the sounds.